Get out now or you’ll die there. You don’t have time to deal personally with the bigger picture day-to-day. But change is occurring rapidly. And change and disruption will hit your industry. Every industry. It often comes from “out of the blue” and from adjacent (or non-adjacent) industries. If the people you’re talking to are inside your business, or within your circle of clients, suppliers, partners and associates … you’re in trouble. The more you prepare forinevitable change, the more successful you will be. In fact, the best winning formula is to capitalize on change, to be the disruptor. But you can’t do this in a vacuum. Sometimes you just need an outside perspective, from people who have worked across virtually all industries and whose job it is to understand things you can’t begin to spend time on … since you’re busy running your business. 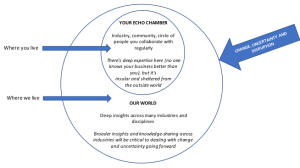 Contact us for a free, no-obligation consultation to discuss how we can help you get out of your echo chamber and disrupt your competition.